​Several years ago my family and I went through a particularly difficult time that created great conflict, division and unrest for all of us. During this time I really began to seek God’s direction for dealing with the circumstances and the trauma, as well as be an influencer to my children and help them survive the situation. I purchased a brand new Bible and I asked God to lead me through these crisp new pages and take me to the words my soul needed to hear, and oh how I needed to hear God’s voice! -- just as much as I needed the air to breathe. Over the next few years God lead me on a journey through His word and revealed things to me I had never seen or heard or understood before! Even listening to sermons and reading devotionals and doing Bible Studies was different, everything held new meaning. In every message, whether read or heard, God sent the exact words that my soul seem to be craving! I had no idea what my soul needed to hear but He did. And oh the sweetness and satisfaction of His words! I wanted to keep those words forever, so I wrote them down, I made notes, I kept journals. I highlighted and underlined and circled and scribbled in the margins of my new Bible. I typed them up, I drew them out and I even taped them to the walls and mirrors in our home. All those precious words, God’s words; I would read and re-read to just love on the messages He had given me! ​Then I realized one day that God was not only revealing Himself to me through His words, but He was also healing me through His words. And not just me, He was healing my family as well! At one time all I could hope and pray was that we would survive, but God had enabled us to thrive! ​My Bible doesn’t look new any longer, the pages aren’t crisp and white. The leather is worn, the binding has torn through and been taped back together, the gold leafing has faded from the edges and the pages are wrinkled, written on and tear stained. I can re-read a passage and be taken back to the very moment when God spoke to me through those very words. Oh His word is so precious to me now. ​But like the great book that our life is, where one chapter ends, another begins. 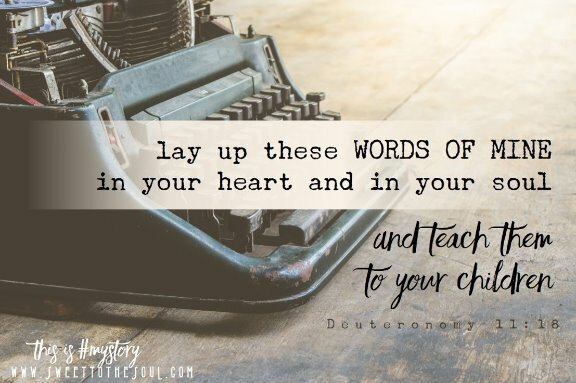 ​A few of years ago now, God told me to share all of these words – His words, with others; to share my story with others. And He gave me His words, a specific scripture for this purpose. 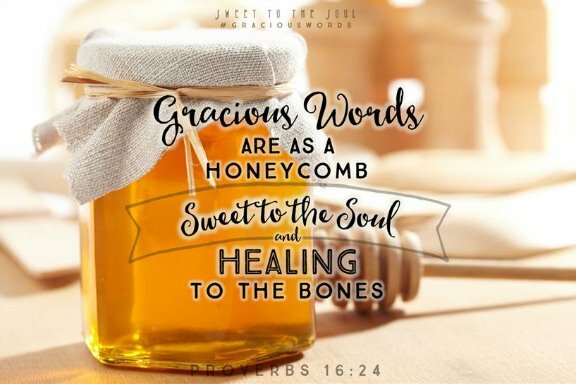 God wanted me to share His words with others so that, like me, they could experience the soul sweetening and bone healing that can only be delivered through the Word of God. Thus, the birth of Sweet to the Soul Ministries. Now I’m not talking about just handpicking those cheerful passages where God promises us blessings. Oh we need to hear those; we need to hear Him reassure us of His strength and provision. But many, many times the words we need to hear are convicting and life changing. In truth, God wants to speak His words over us every day, in every situation, and for every reason – encouragement, empowerment, *salvation & deliverance*, redemption, forgiveness, restoration; for all of those reasons, and for every other. God shared His words with me and now, through the ministry of Sweet to the Soul, I want to share them with you. You may have noticed that the beginning of this little story was a bit vague. No details about what happened or the situation. And that’s on purpose. What happened isn’t important, it’s not the message… what God did is the message, what God did is what is important. You see, I could fill a book with the details of what happened, but it wouldn’t be important because those would just be my words, and there is no power in my words. But there is power in God’s words, awesome extraordinary world creating, life giving, miracle performing, soul saving power! … Soul sweetening and bone healing power! 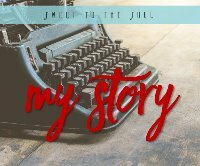 Today's blog post is the first in our "My Story" series. Join us all year as our Sweet To The Soul Team Members, Contributors and Ministry Partners share their stories. And watch for opportunities to share your story as well! Not sure you have a story - oh yes, friend, you have a story! We all do. Not sure how to tell or write your story. We'd love to help you do just that. I so want to thank you for your faithful, heart-felt messages that daily fill the inbox. Reading your story only solidifies the messages all the more. God is the message - you are just the messenger. The vessel of honor. Thank you for being a wiling servant of our Saviour! Thank you for sharing from your heart, and you are so right -- the details are not nearly as important as the faith-filled outcome! Amen, God is so good to take our messes and turn them into a message from Him. Jana, you have been encouraging me with God's Word through your lovely artwork for about a year now. I am so touched by your story. I have experienced this truth, as well. Revealing and healing he does through his living, active scripture. I look forward to what your year of stories hold. Isn't this so true! We find healing in God's words. Our family too went through some struggles several years ago, there were days I wasn't sure we'd make it through without long term damage. God did heal. He redeemed the years the locusts ate and I have an amazing family! Popped over today from Testimony Tuesday. I love everything you say here and yes, God's word heals! Praise Him!! I'm so glad He did that for you and created your ministry. The details of your story do matter too: God speaks through the specifics of our life stories so others find themselves and God in the light. I'd love to hear more of your story someday, Jana. Thanks for sharing! Lovely words of hope and encouragement here. I am glad to have connected with you.